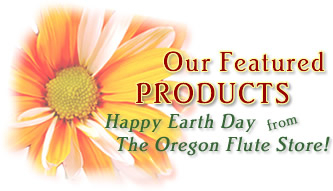 Welcome to the Oregon Flute Store's "Featured Products Page" for April. Each month, our newest products will be presented here with special pricing. To Save money on high quality Native American style flutes, flute cases, flute accessories, and more, bookmark this page and come back at the beginning of every month to see what our discounts are! We don't get many of James' cane flutes because he is partly retired and only makes a few a year. These three flutes arrived just in time for the Holiday season. A great opportunity to buy his "hard to get" flutes as a gift or for yourself. We only have three in stock and when they are gone we won't get any more until James sends them to us. We get what we get when we get them and never know when or what keys or styles he will send. Don’t miss the opportunity to own one of these great flutes! 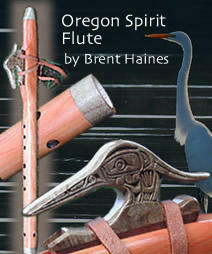 An Oregon Flute Store Exclusive! We just received new inventory of these flutes ready for immediate shipment. They are a true representation of our state crafted from indigenous Myrtle wood and Oregon Juniper with a special north coast style blue heron block. 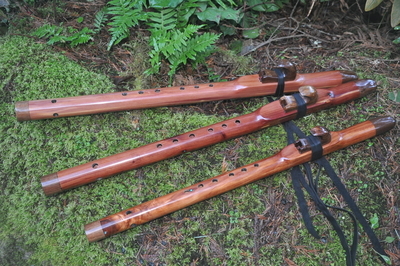 New Arrival Cedar Classic flutes by Woodsounds ready for immediate shipment. They have the same beauty and quality of Brent's flutes that you've come to expect at a better price point. These are perfectly tuned high performance flutes beautifully designed with all of Brent's well known flute features. Many thanks for the "Crow" hard case; it arrived in great shape. I'm very impressed with the quality, the speed with which you acted on the order and the price you charged. The entire transaction was a pleasure -- so: many thanks.